One of the most colorful and diverse groups of invertebrates found on coral reefs are soft corals (known scientifically as Alcyonaceans). These cnidarians are related to stony (scleractinian) corals, but they lack a massive, calcified skeleton and have eight hollow feather-like tentacles instead of 6 or multiples of six found in stony corals. They include two groups, the true soft corals which lack a rigid internal skeleton, and gorgonians or sea fans which have a solid internal axis made of a hard protein similar to a deer’s antlers. Both groups often have calcified spine-like spicules (called sclerites) that provide support and protection. 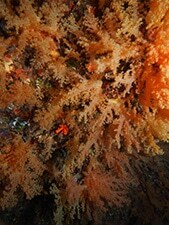 In the Caribbean, branching gorgonians and sea fans are the dominant growth forms; in the Pacific they are much more diverse and include fleshy soft corals as well as gorgonians. During our surveys in Tonga, we’ve found unusually high numbers of thick, leather-like soft corals, in some cases carpeting much of the bottom and leaving little space for stony corals. These are particularly successful because of their fast growth rate and ability to reproduce sexually and also asexually by dividing into multiple colonies (through fragmentation, fission, budding and the formation of runners). This allows them to quickly recolonize a disturbed area. Many of these also house algae (zooxanthellae) within their tissue, just like stony corals. 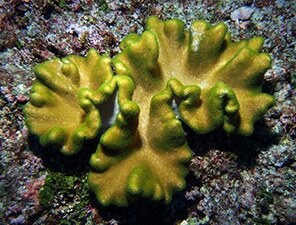 ‘Sarcophyton’ species showing how it monopolizes the substrate through asexual reproduction. 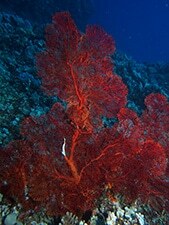 Richly branched, fan-like or net-like gorgonians are also quite common in Tonga, but they occur mainly on deeper reefs and on vertical walls. These achieve remarkable sizes, some species exceeding 1 m in height. On a few of the deeper wall dives, we’ve also found assemblages of bushy or arborescent soft corals that are much stouter than gorgonians but lack an internal skeleton. These occur in every color of the rainbow. 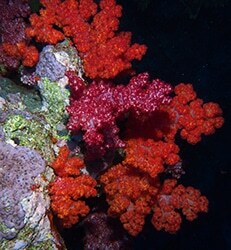 Some have a fat, bare stalk with bundles of polyps clustered on the branch ends, while others form translucent bushes, with conspicuous white spicules and individual polyps distributed on the terminal branches. 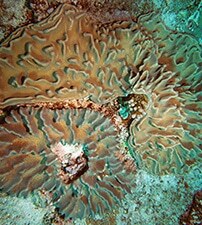 In most cases these types of soft corals occur individually, or in small groups. At the western end of Ha’apai, we found a dense population of these types soft corals in deeper water, concentrated in caves and under ledges. 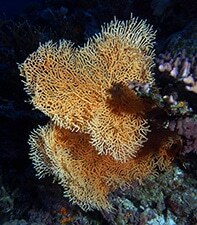 This is a true soft coral in the family Nephtheidae that we saw all over one of the walls of our dives. 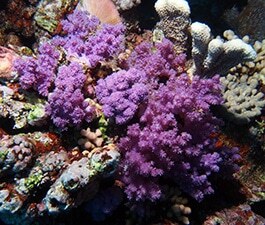 In addition to their beauty, soft corals are vital components of reef environments, in some cases contributing to reef structure, and a significant source of natural products used in biomedical research, cancer therapy and pharmacology. 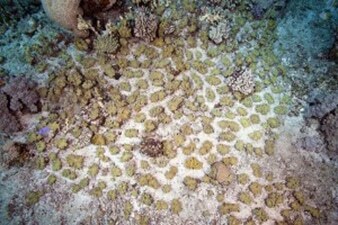 These are “leather corals” that have zooxanthellae. It monopolizes the reef substrate. In this example it is growing around a digitate acroporid coral.